It's August ...which means 2 things. 1) It's time to start back to school shopping for the kids and B) I'm finally turning 30. After many years of turning 29, I was set to turn 29 again this year, but then the kids learned to count and at one point during one of our Q & A sessions when the kids asked me how old I'll be on on my birthday, they figured out something wasn't adding up. They called me on it a few weeks ago. "No Mommy, you're turning 30, silly! 30 comes after 29!" Oh yes, silly mommy...how could I have lost track like that?? You got me kids....I'm turning 30. The big 3-0!! Can't fool those two, can I? Turning 30 isn't the only big change happening around here. The kids will both be starting school - Lauren will be going to Kindergarten and Ben will be going to preschool. Lauren will be going to FULL DAY Kindergarten and I'm finding it hard to wrap my head around that. She went to preschool last year - 3 hours a day, 3 days per week (the same program Ben will be doing this year). It's quite a leap to go from that to full day school 5 days a week. My little girl is growing up and starting a new chapter in her life. I mean, she's very excited about it all - we all are. But to me, who has been home with her since she was a baby - It feels like she's heading off to fashion design school in New York City and moving into an art loft with a like-minded roommate named Pierre. Next thing I know, she'll want to do a year abroad in Paris where she'll wear colorful berets and eat croissants and decide to change the spelling of her name to Lauryn. Damn you, Pierre...damn you! I knew that kid was a bad influence with his french accent and skinny jeans. Ok, Ok...I see I've gotten a little carried away. Clearly Mommy needs some extra Xanax. Anyway, Lauren starts school at the end of August & Ben will be starting the second week of September. I will also be starting my 200 hour Yoga Teacher Training - YAY!! It's something I've wanted to do a for a while and the timing works out great. I'm finding that as my children grow and enter new chapters of their lives, those are the times I tend to reinvent myself. I almost don't realize it's happening, but that seems to have been a consistent pattern over the years. Sometimes in small ways, even...but it's definitely been a theme for me. In other news, in my last blog I told you that my house may be haunted. Well no more strange occurrences have happened, and remember how I told you I lost my car keys somewhere between my car in the driveway and my house? Well like a week later my neighbor, Tracy, who lives across the street from me sent me a text asking me if the keys I lost were Nissan keys. Turns out they were in her front yard. Obviously....why hadn't I looked there? (I jest). There's just no reasonable explanation as to how my keys ended up in her front yard. Let's say I dropped them in my driveway and I didn't realize...they were far too heavy for wind to have blown them over there. Then I wonder if maybe someone....maybe the mailman or someone walking by, saw them in my driveway. But why would they take the keys out of my driveway only to throw them across the street into my neighbors front yard? I don't know...it's strange for sure, but the only logical explanation here is that there's some kind of a portal...from the key holder in my kitchen that leads straight to Tracy's front yard. Kind of like in the movie "Being John Malkovich" where the portal behind the file cabinet leads into his mind and then after 15 minutes spits the person out onto the side of the New Jersey Turnpike. So next time I'm missing my Chapstick or something, the first place I'll check is Tracy's front yard. So that's a relief - no haunting. Just a portal. Lastly, I've gone Gluten Free again. I always just feel better when I'm not eating gluten. Plus, now there's tons of awesome gluten free products on the market now that they didn't have a few years ago when I first decided to ditch the gluten. It's really a lot easier now, and I'm noticing a lot more products are actually labeled gluten free so that you don't have to look up the 20 different ingredients a product contains to figure out if any of them is code for GLUTEN. Here's my latest gluten free find (thanks to a tip from an awesome Naturopath I see) and it totally rocks. 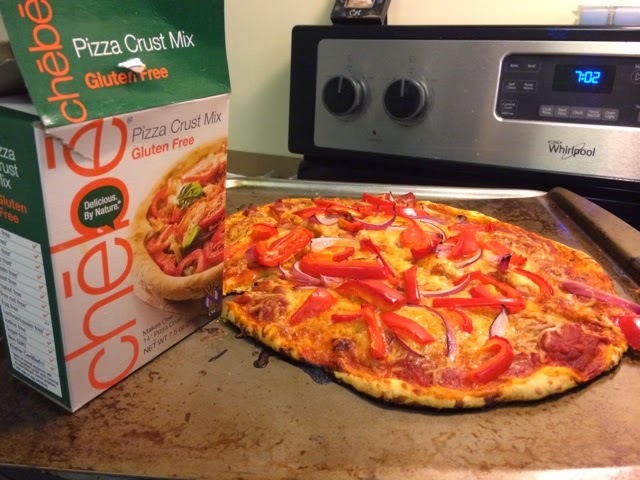 It's called Chebe Pizza Crust Mix and it makes a kick a$$ pizza crust that you'd never know was gluten free. This entire pizza is gluten free and it was yummy and didn't make me feel like I was missing out on anything. And on that note, I'm off to search Tracy's front yard for my sanity...it's been missing for quite some time now.